Portland City Councilor Ed Suslovic, right, presents the Portland city flag to a representative of the Russian sister city of Arkhangelsk in this 2007 photo posted by the city's Archangel Committee. 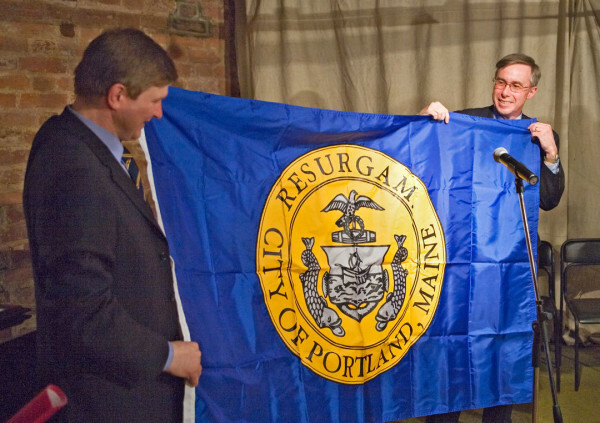 PORTLAND, Maine — In 2007, representatives of Portland’s sister city of Arkhangelsk, Russia, asked local City Councilor Ed Suslovic to bring a city flag to the country to be flown during their America Week celebration. Radio host and flag enthusiast Roman Mars delivered a TED talk last year about the importance of strong municipal flags, and video of the presentation was passed around in subsequent months by Portland residents. The city’s blue and gold flag was included in a collage of municipal flags Mars said were badly designed and, in many cases, forgettable. Now, many Portlanders are saying they couldn’t agree more, and that the city should adopt a new one. “The city of Portland’s flag violates nearly every principle of good flag design,” said Tim Schneider, an attorney and Portland resident who has shared the Mars video with friends. In Mars’ talk, he cites several principles of design determined by vexillologists — people who study flags and their symbolism — to be shared by successful flags. Among them are that flags should be simple enough that children can draw them from memory, that they should be distinctive and that they should never include seals or words. Portland’s flag consists of the city’s nearly two-century-old seal and — in most versions — the words “City of Portland” on a dark blue background. It’s what Mars said vexillologists deride as an “SOB,” or “Seal On a Bedsheet,” a somewhat ubiquitous and unimaginative design used by a number of cities and states, including Maine. The flag, which flies outside City Hall and is displayed in the City Council chambers, is successful on a few principles Mars listed: It incorporates meaningful symbols and is just two bold colors. “I, for the life of me, can’t find one person who knows anything about it. Or one person who thinks it’s awesome,” said Stuart “Tuck” O’Brien, who works in the city’s planning department, but has taken an interest in the city’s flag outside of his professional responsibilities. Local historian and former lawmaker Herb Adams said the symbols represented in the city seal are important, but said effective flags usually involve simpler adaptations of those symbols, rather than just the full municipal seals themselves. Adams said the seal features two dolphins indicating ties to the sea, a boat likely representing the launch of early 17th century explorer Christopher Levett, an anchor wrapped in rope and a phoenix, a mythological bird that rose from the ashes of fire, as Portland has done several times in its history. Adams said that unlike the seal, which records show clearly was adopted on April 30, 1832, the history of the city’s flag is something of a mystery. It’s unclear when, or if, the city ever officially adopted the banner now taken for granted as the city’s flag. Or if the city just started using it somewhere along the line and nobody questioned it. In his talk, Mars said cities with successful flags — like Chicago and Amsterdam — can see those banners waving throughout the cities and displayed proudly on merchandise. Those with flags that don’t resonate with residents will find that most people don’t even realize the flags exist. “It’s clearly not memorable. I’ve never met anybody who’s all that excited about it,” said Chris Korzen, who runs the Portland-based Maine Flag Company with his wife. “I think we have a huge opportunity here, not to replace the flag, but actually to have an official flag for a first time. The city of Bath is a recent example of a Maine community that chose a new flag, adopting a design by Jeremy Hammond, who now lives in South Portland, in 2013. The Hammond flag featured a gold sailing ship against a red background across the top half and blue waves, representing the Kennebec River, on a white background across the bottom half. Hammond said if Portland decides to redesign its flag, the city should beware of including too much clutter, a trap some designers fall into when trying to please too many people by incorporating every idea put forth. O’Brien said he believes a simple vote of the City Council would be all that’s necessary to adopt a new city flag, although he acknowledged the council would likely seek a heavy amount of public input — and perhaps an inclusive design process — if it felt getting a new flag was worthwhile. “I think if people want to take a look at the city flag and come up with new ideas, that would be fine,” said Suslovic, who noted he’d have to see what new design proposals looked like before he decided whether to endorse any.